Varsity softball had a great season, going 11-1 in the league and 14-7 overall and claiming the Prep B title for the second consecutive year. The Knights opened the season at home with an 8-4 win over Mount Saint Mary’s on April 5. Leading the charge was Emma Corbett '16 who struck out 16 over seven innings and went 4-for-4 with five RBIs. Also off to a great start were Maddy Bedrock '17, Grace Beveridge '18, Sam Delehanty '16 and Kaitlyn Moriarty '16, who each recorded a hit for the day. On April 11, Bedrock threw a seven-inning perfect game in which she struck out 13 to lead the Knights to a 4-0 win over Rutgers Prep. On April 13, the team showcased its powerful hitting lineup in a 10-6 victory over North Plainfield, with homeruns off the bats of Bedrock and Beveridge and hits from Claire Chestnutt '18, Corbett, Delehanty, Moriarty and Dannielle Towle '18. Pitching would be the deciding factor in the next two games, with Corbett holding Bound Brook to two runs on April 15 to help the Knights to a 3-2 win, and Bedrock pitching a complete-game shutout (3-0) against Manville on April 18. At the plate, Moriarty contributed two hits in the Bound Brook game and Corbett brought in all three runs in the Manville contest. 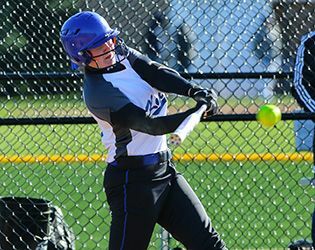 Another win followed on April 19, with Corbett holding South Hunterdon to one run and Towle leading the offensive charge with a homerun, four hits and five RBIs in a 14-1 victory. The team mounted another 14-1 victory over Princeton Day and then suffered a 7-1 loss to Bridgewater Raritan. The squad rebounded to close out the April with a pair of wins: 6-4 over Mount Saint Mary’s and a decisive 17-3 victory over Manville. Underclassmen came up big in the Manville matchup, with offensive contributions from Carolyn Brand '17, Chestnutt, Ilana Druskin '19, Carolyn Herrlin '19, Nour Marzouk '18, Emily Supron '17 and Towle. The Knights opened May with a 10-0 victory over North Plainfield, with Emma Corbett earning the shutout. At the plate, Bedrock led the scoring with one homerun, three hits and two RBIs. The team defeated South Hunterdon 6-3 on May 9, with Corbett providing a two-run homerun, Towle serving up two hits and an RBI, Supron contributing a hit and an RBI and additional hits coming from Bedrock, Beveridge, Chestnutt, and Delehanty. The Knights struggled at the plate over the next three matchups, falling to Bound Brook, Somerville and Blair. On May 17, the team came back strong to win the Prep B semifinal (9-6) over Montclair Kimberley. Leading the scoring were Bedrock, who went 3-for-4 with four runs and two RBIs, Towle, who went 2-for-4 with two runs and two RBIs, and Chestnutt who went 3-for-4 with three RBIs. On May 19, the Knights defeated Morristown Beard in the Prep B championship (9-4), having toppled Rutgers Prep 11-0 the day before. A two-run homerun from Beveridge gave the Knights an early lead in the championship and Moriarty contributed a two-RBI shot in the fourth. The Knights closed out the game in high style, with two strikeouts from Corbett and a diving catch from Supron in right field. Looking ahead to next season, the team will miss the contributions of recent graduates Corbett, Delehanty and Moriarty. Rising senior Bedrock, who pitched five wins and came up big on offense, will be a vital part of next year’s lineup. In addition, the team will look to rising seniors Carolyn Brand, Genny Fischer and Supron for increasingly important contributions. Boding well for the depth of the program, a talented group of rising juniors will return next spring. Among them, Beveridge, Chestnutt, and Towle were a powerful part of this year’s offense and Alex Delehanty, Marzouk and J.J. Neville showed great promise at the plate. The team will also rely more on the contributions of rising sophomores Druskin, Herrlin and Brooke Starr.